Mottled Quills are used for hopper, muddler, and caddis wings as well as wing cases on nymphs. 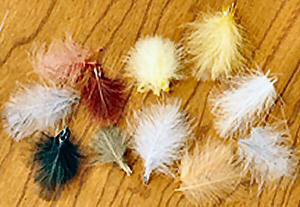 The Barred Quills are dyed to different colors and are usually used for hopper legs. These broad square tipped feathers located on the lower back of the turkey. Flats are used for parachute, thorax and divided wing dry flies. They are durable, easy to work with and produce a good wing silhouette. Mottled turkey flats have a flecked pattern that duplicates subtle markings found on the wings of numerous natural insects. Bronze Mallard comes from the shoulders and has a natural bronze cast that is unique. It is used on many dries, steelhead, and salmon flies. Woodduck is a Noth American duck very similar to it's Asian cousin, the Mandarin Duck. 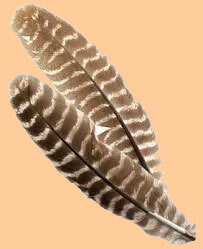 The flank feathers are particularly prized due to color, barring, and texture. Feathers will vary in size and shape. 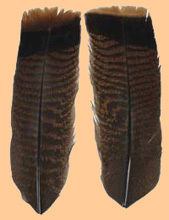 Selection of the type of feather is important as to what type of wing can be tied with the material. The Barred Lemon Woodduck is traditionally used for dry fly wings and tailing materials on mayfly nymphs. The Barred Black/White Woodduck is often used within Atlantic Salmon patterns. The material is used for dry and wet flies, streamers, and Nymphs. The mottling and coloration are of the woodduck is an important attribute for the legs and tailing of mayfly nymphs and emergers. While Mallard Flank is dyed to a Imitation Woodduck, it cannot substitute the texture and barring characteristics of the real thing. 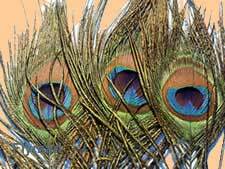 Ringneck Pheasant Tail feathers have thick-barbed fibers with brown, olive, and black colorations. The barbs are used for tailing materials, legs, and bodies. Perhaps, the most well known use is on the Pheasant Tail Nymph which is constructed entirely from Pheasant Tail fibers with a ribbing of gold wire. Tails are dyed in many colors such as Black, Brown, Green, Olive, Orange, Purple, Red, or Yellow. 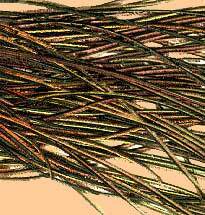 Hungarian Partridge is the most widely used soft hackle. It comes in shades of brown and gray with fine speckles and barrs. The fibers are straight and will flare when turned as a hackle. A skin is generally preferred since size and selection is easier.The hackles are used for tails, wings, wing-cases hackle, and bodies. 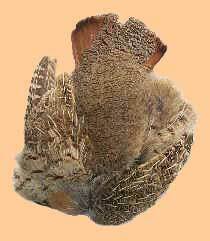 Dyed Partridge skins are available in Brown, Olive, Burnt Orange, Caddis Green , Bleached Ginger, and Yellow. Peacock Herls are the fringy feather parts on the shaft of a Peacock Tail Feather. 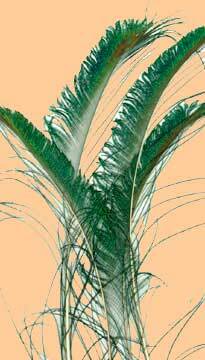 They are small irridiscent fibers with green, copper, bronze, and blue highlights. Herls are used for bodies such as the Prince Nymph. They are also used as Thorax materials on many nymphs. Peacock Swords are finged green feathers that line the edge of the peacock fan. It is usedd for tailing material on flies such as the Zug Bug. Eyes can have both herl material and sword material within them.